Lucom Biometric Signing software fills the security gap within many processes. Compared to an Ink signature on paper it captures ca. 7 aspects (pressure, speed, rhythm, acceleration, etc.) of handwriting instead of pressure into paper as the traditional pen and paper signing. 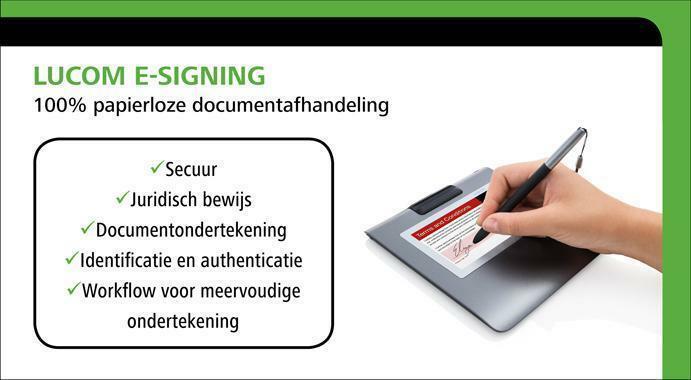 In perspective of the ‘Digital World’ the Biometric (Digital) signing is almost a necessity. When signed paper documents are scanned and paper is destroyed; at that moment a signature loses almost all its’ probative value. It is reduced to a picture without proven binding to the document. PKI certificates are often called Digital Signatures, but it’s not a signature. It only proves that the person that ‘signed’ the document was in possession of the PKI device. Lucom also adds PKI certificates, but for time stamping and as the extra security key that seals the document that was signed with the Biometric Signature. So the combination of the Biometric Signature and PKI proves the source of the document as well as the details for proving who signed the document. The above usage offers a secure and legal valid process / procedure. The Biometric technology also offers secure identification and authentication possibilities preceding a process. The signature of individual persons can be kept in a secure profile and at the moment of signing, the process continues only when there is a match between the signature and the profile! - Fraud often starts with a falsified identity check and the Biometric signature enables organizations to avoid the start of a fraudulent action or process. - The signatures and Biometric data within a document cannot be transferred for other purposes or abuse. - Profiled signatures cannot be uploaded from a database, but can only return the match result to the requestor.